Francis needed to be alone. He needed to be alone so that he could think, which was why, despite the weather, he carried his bag and his lunch to a bench on the far side o f the playing field. This is one of those books, that you can tell that every word written has been carefully selected. There isn’t any extra waffle, just a beautifully crafted tale. 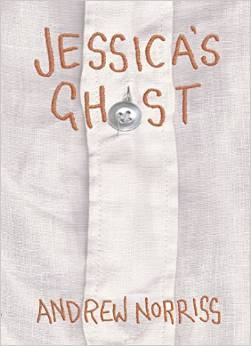 Jessica’s Ghost deals with depression in children and it highlights the reasons it occurs and how it affects people. It’s like a dark cloud that descends and can either be lifted briefly or rains heavily for a very long time. Each child in the story had thoughts about killing themselves. They felt the situations in their lives were so out of control, they could no longer deal with it. They wanted out of this life. It hurts to read that kids feel this way, but it isn’t uncommon at all. Kids constantly struggle to fit in. They want to be liked by everyone and be considered the same. What this book shows you, is that it is alright to be different. The world would be a very boring place, if we were all the same. This story encourages children to accept who they are and learn to love themselves. The kids in this tale were soon left alone when they became confident and started believing in themselves. Life can change in a matter of minutes; what appears to be the worst thing ever can alter to bring you hope, happiness and joy. This story also shows that talking to someone helps. If kids have worries, it is better to share it with someone than to keep it bottled up. Worries just build and build if you let them, until they are bursting out of you. As my grandmother used to say, ‘a worry shared is a worry halved’. I loved this book completely. I loved all the characters and how they stood out from the crowd. They were each unique and it was wonderful to watch them learn to live with their uniqueness. They all blossomed as the story progressed. This really is a beautiful book that deserves to be read by every child. I really hope when it is comes around to picking books for the 2015 Middle Grade awards, that this book appears on every list. An ideal gift for any child you know that worries or frets over life. A must-have in every school library.